The crew and I have been working hard through the Pirate Spiral. Not long after the New Year, we sailed to the Tradewinds Skyway to seek out a trade agreement with the Governor in Puerto Mico. A bunch of nasty untrustworthy little creatures those monkey folk are. If you ever have to have dealings with them, I strongly advise caution! We ran some errands for a few folk in the village. Our adventures were made easier thanks to a quick visit to Scrimshaw. I was able to pick up some new cloths. But better still we found a local merchant who helped us retrofit some new equipment for the Dashing Star. We acquired new armor, guns and sails. Temujin is really enjoying the new guns. He likes the thud sound they make when fired. I think that’s a guy thing. Though that devilish smile he gets when they fire is kind of endearing. And the new sails really make her look exceptional! Our real quest was to find the Gold Mines and bring back Gortez to the Governor. I must say I wasn’t expecting to fight a forest of trees to get there. Sometimes the Pirate Spiral can surprise you with strange creatures and unusual folk. We meet an old tree named Banyon. A kind sort, but his brethren weren’t so nice. It took a little effort but we were able to dispatch them well enough. We also ran into some of the Armada. Those clockwork guys give me the creeps! Thankfully we were able to avoid most of them and focus on finding Gortez. We had a somewhat disturbing encounter in the Crystal Cave and a strange ghostly conversation with my Parents. Messages from the dead never seem to be a good thing. We’ll have to wait and see what that was all about. Finally we were permitted to see Gortez in his golden pyramid. Capturing him however was not an easy task. We took several casualties along the way. But thanks to the Life Fountains, everyone has been restored to health…a couple of times actually. We made a few jokes about Zombies which Old Scratch didn’t find amusing at all. Can’t imagine why! Speaking of Scratch, we’ve taken on several new crew members. Interestingly enough, Ratbeard is one of them. We also meet Mormo, a Watermole Witchdoctor. It’s nice to have another magikal witch to talk to and learn from. I may have even taught him a thing or two. We meet up with Bones McGee, a Skeletal Corsair when we helped Captain Charlie Kennit in Flotsam Docks. We rescued Young Jack in Shady Hollow for him and Captain Kennit provided us with one of his crew members as a reward. At first we wondered if we were getting conned. But it turns out Ole Bones is a pretty good shot and has really come in handy. We also picked up Batacuda, a Flying Batacuda we earned from helping one of the monkeys in the first encampment in the Gold Mines. Bonnie was a bit worried about taking him on. She said fish smell terrible. Well that may be true, but I think she meant dead ones and Batty certainly ain’t dead. And he really has been a nice addition to the crew. Not to mention he doesn’t say much. Wish I could say that about some of the other crew members. As I was saying, we captured Gortez and took him back to the Governor in Puerto Mico. It seems however there had been an over throw and a new Governor was in charge. One who didn’t know about our deal and wouldn’t honor our agreement with the old monkey in charge. See, you can’t trust these stinky creatures! We were forced to take Gortez to the King Monkey in Monquista. We picked up a portal stone and sailed head long into our first Stormgate. THAT was an experience! It’s an eerie but very beautiful place. Makes the trip to Monquista much quicker than simply sailing through the skyways. If you can even get there from here. I don’t think so. Ole Scratch said he had heard tales of sky sailors taking long long journeys to get between worlds long before the Stormgates. Could that be possible? It seems unlikely to me. Sometimes I think Scratch has had a little too much of his own potions. But he sure does tell some entertaining tales of days long gone by. Anyway we made it to Monquista and we’ve been questing around this desert filled land for a little while. It’s hot here and these monkeys are somewhat smelly. And of course you can’t trust any of them. We’re on the hunt for something called the Monkey’s Paw. We’ve already picked up some great treasure and good leads about its location. We’re currently headed to the Abbey to learn more. Oh I almost forgot the really big news. Along our journey I was called back to see my teacher Valdima. She honored me with a new promotion to a level 15 witchdoctor. The promotion also qualified me for a special spell quest. It required defeating Mojo who was hiding back at the Gold Mines. Took a little doing, but we managed to defeat him and his minions. 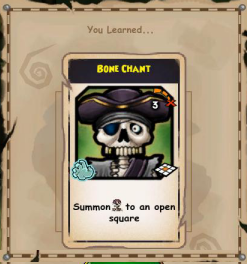 Our success earned me the Bone Chant. Can’t wait to use it in our next battle! And Timujin also gained the opportunity to acquire a new title as well. 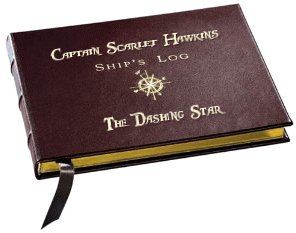 I heard from my cousin Captain Victoria Bristol about the promotion of her first mate Subodai. When he reached a certain level of his experience he decided it was time to enhance his training by meeting with his ancestors. They went on a quest to gather some items that would help him speak with the ancient ghosts and in doing so he attained new knowledge strength and wisdom. Thankfully with Timujin we didn’t have to do that. 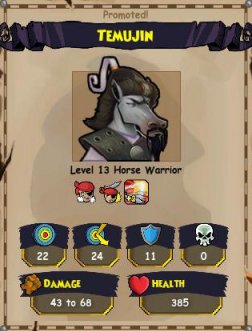 His promotion was one we simply had to pay a fee for and he was bestowed the honor of becoming a level 13 Horse Warrior. He has been a great first mate and it’s wonderful that he has been recognized for his skill and success as well. Now we’re onto the Abbey and in search of the Monkeys Paw.